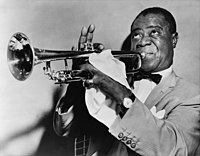 Trumpadóir agus amhránaí snagcheoil Meiriceánach ó New Orleans, Louisiana ab ea Louis Armstrong (4 Lúnasa, 1901 – 6 Iúil, 1971; Satchmo nó Pops, mar a thugtaí air). D'imir Armstrong tionchar bunúsach ar fhorbairt an shnagcheoil, ag cur béime nua ar an dtaispeántas aonair in áit cumadóireacht ar an láthair mar bhall de ghrúpa. Tugadh an leathanach seo cothrom le dáta an 27 Márta 2015 ag 11:21.